Matt Hughes is not yet ready to leave the Octagon, but a "Chuck Liddell job" looks appealing. “Maybe one of those Chuck Liddell jobs? Who doesn’t? You don’t want a paycheck? It does appeal to me. However, that doesn’t mean that Matt Hughes is ready to take the position just yet. His love for action, the hunger to be the best, the camaraderie of his teammates and training partners are still one of his source of joy in every aspect of MMA. But he also admits that the 21-second loss against BJ Penn at UFC 123 made him consider all possibilities. Regardless, he wants nothing more than to end his career on the strength of a win. Still, he hopes that his competitive drive doesn’t led him into hanging around too long. He has 18 UFC wins, he successfully defended the welterweight championship belt seven times, he defeated six current or former UFC champions, and was inducted to UFC Hall of Fame in May 2010. Pretty much, there is little – if anything – left to accomplish. 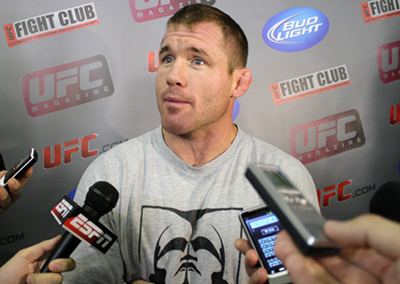 Matt Hughes’ UFC 135 bout is the final contest on his current contract. And should he sign another deal, he will only go bout-to-bout. He said that it will only be big fights if he stick around. Moreover, he might be willing to entertain a catch weight match at 165lbs if the match-up is right. But win or lose on Saturday, Matt Hughes said that he’ll head home after the match to talk things over with his family and UFC brass before making a decision.